My 10 year high school reunion was supposed to take place this year, but it was cancelled when not enough people RSVPed-- apparently in the era of Facebook, you don't need to actually show up in your old high school auditorium to find out what your old classmates are up to. So if the 10 year reunion tradition really is dying out, at least it will be celebrated one last time on film with the upcoming movie 10 Years, a reunion movie that features a laundry list of young up-and-coming stars who are all about the right age for their 10-year-reunion. The movie comes to theaters September 21, and you can see its brand new poster below. Over at Entertainment Weekly, the film's writer and director Jamie Linden-- who met star Channing Tatum on the set of Dear John and cooked up the reunion idea with him-- explains that a lot of these actors really do know each other from back in the day. "Kate [Mara] and [Anthony] Mackie have known each other for a long time. And Mackie and Oscar [Issac] went to Juilliard together with Lynn [Collins]. 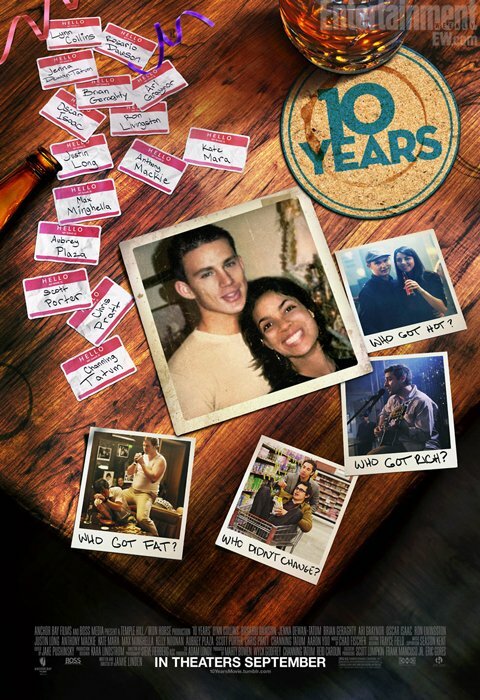 There’s all sorts of one degrees of separation with all the cast.” The photo of Tatum and Rosario Dawson at the center of the poster, though, is Photoshopped-- the two play a pair of high school sweethearts who haven't reconnected until their reunion comes around. With the promise of a lot of other reunion drama, and of course the chance to see all these young actors share the screen, 10 Years looks interesting for the nostalgic among us-- or maybe that's just coming from someone who feels robbed of her own reunion.